Marvell announced it started sampling its 88SS1093, a new SSD controller that features four PCIe Gen3 lanes with 4GB/s of bandwidth. Besides enterprise and datacenter applications, the controller is also intended for "extreme-line client" SSDs. It supports up to 2TB of NAND flash memory and supports all modern flash chips, including 15nm TLC and 3D NAND. Sampling to customers just started so hopefully we'll see some disks in the next couple of months. Marvell (NASDAQ: MRVL) today announced the introduction of its first native Non-Volatile Memory Express (NVMe) solid-state drive (SSD) controller, the 88SS1093. 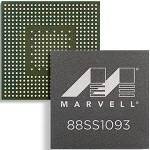 The Marvell ® 88SS1093 NVMe SSD controller delivers high-performance solid-state storage solutions with a fully Flash-optimized architecture overcoming the SAS/SATA performance limitations by optimizing hardware and software to take full advantage on NAND and addressing the needs of data centers and client systems that utilize next-generation PCIe 3.0 SSD storage. The 88SS1093 also integrates Marvell’s third generation NANDEdge™ error-correcting, low-density parity check (LDPC) technology for higher reliability and endurance boost that was previously announced with Marvell’s fifth generation SATA SSD controller, the 88SS1074.